By default, hg status shows modified files with path from the root of the working directory. Most of the time, I would like it show the paths relative to my current directory. There is no --relative option and due to the few people who need this feature, Mercurial developers have said that such a flag will not be added. It is easy to ignore files and directories in Git or Mercurial. Ignore files can be maintained at both the user and repository levels. Git or Mercurial automatically ignore the files and directories that match the patterns listed in these ignore files. Being a version control system from an older era, Subversion does not have this simple method of ignore. In SVN, ignoring a file or directory is a property that can be set at a specific directory in a repository. $ svn propset svn:ignore build . $ svn propset svn:ignore *.tmp . Note that both these commands set ignore properties for the current directory . $ svn propset svn:ignore -R *.tmp . $ svn propset svn:ignore -R -F ~/.svnignore . Note the difference with Git or Mercurial. You have to manually set this ignore property on every directory. The ignore file we created is for our convenience. If you create a new subdirectory anywhere in this repository, the property needs to be applied again on it. Remember to commit after setting the ignore property. Record is an important extension for Mercurial and it ships along with it. It provides the record command, using which you can pick and choose which changes and modified files you want to commit. It feeds you the changes and modified files in an interactive format, so you do not have to type out long paths or other specifications. You can specify which of the modified files you want to commit to the commit command, but typing out the file paths like that is cumbersome. Also, it does not allow you to pick and choose changes inside a file. I feel that the record command is better for this use case. Install the Watchman tool as described here. abort: No module named bser! bser.so is a module that is built by this step. That is it! You should see a nice improvement in the performance of hg status after using hgwatchman. hg status is the slowest command in Mercurial and can take several seconds on repositories with thousands of files. This is because it needs to check every single file and directory in your repository to see if it has changed. One method to speed up this command is to use the inotify extension for Mercurial. Note: This extension is reported to be buggy and using the alternate hgwatchman extension is recommended. Note: This extension only works in Mercurial 2.x. It has been explicitly disabled in Mercurial 3.x and will not work. This extension ships with the mercurial-common package and so it will already be installed on your system if you have Mercurial. It relies on the inotify subsystem of the Linux kernel and any kernel later than 2.6.13 will have it. It uses the filesystem to watch for changes and reports these to applications. Using this Mercurial can check the status of gigantic repositories quickly. That is it! I noticed a speedup on a large repository with 500K files, but it was not as much as I wanted. When I am at the shell inside a Mercurial repository, I sometimes want to list only those files that are under version control and some details about them. Something like the ls command, but for Mercurial. That is exactly what the HgList extension for Mercurial sets out to do. 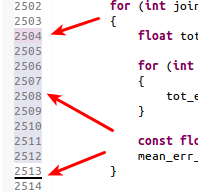 Added, modified and deleted lines marked by Quick Diff in Eclipse editor. Go to Window -> Preferences -> General -> Editors -> Text Editors -> Quick Diff. This is the dialog from where it can be configured. Turn on Quick Diff, by enabling the option Enable quick diff. Choose the version control system for which Quick Diff is needed from the dropdown Use this reference source. Git, SVN and CVS should be present here. Mercurial appears if the MercurialEclipse plugin is installed. The overview ruler is the ruler to the right of the scrollbar in the editor. If you would like to see the uncommitted lines to be marked on it, enable the option Show differences in overview ruler. Choose Apply and OK. Close all editor windows and reopen the source file that you want in the editor. You should be able to see the newly added, modified or deleted lines marked in colors in the left bar on which line numbers are usually displayed. The colors used are the ones set in the Quick Diff dialog (see above steps). You can also view these uncommitted locations marked along the overview ruler on the right. The MercurialEclipse plugin brings support for Mercurial to Eclipse. I usually manage Mercurial from the shell. To enable Mercurial support for an existing project that is placed in a Mercurial repository is easy. Click on the project in Project Explorer, choose Team -> Share Project. Click on Mercurial and click Next. Choose Use existing repository in parent directory. Check if the path in Selected Repository is correct. Click Finish. When Mercurial support is working, you can see that the directories and files shown in Project Explorer have icon overlays that indicate their modified or committed status. Almost all the Mercurial operations can be accessed by clicking on the project or file in Project Explorer and choosing Team. Its a bit confusing that this is not named something appropriate like Mercurial or Hg or even version control. To view the history log of the project, choose Team -> Show History. The History window is shown at the bottom of Eclipse. To enable viewing the graph of changes, click on the Show Parent History button in this window. To view the uncommitted changes of a file as a side-by-side diff with its parent revision, click on the file and choose Compare With. Other basic operations of this plugin are described in this page. If you did hg add and mistakenly added some files, then do not worry. As long as you have not committed them, this operation can be undone easily by using revert.